As one of the oldest suppliers of this complete program our logo documents "competence in pipe and channel". Our delivery program covers among other things drain cleaning snakes for professionals and do-it-yourself enthusiasts, accessories for the channel cleaning (e.g. 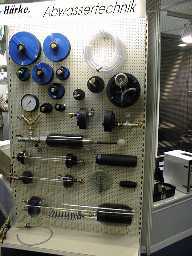 drain cleaning rods) as well as blocking-off technology for pipes and finally tubing inspection technique (e.g. flexible multi-size plugs, test plugs, mechanical and pneumatic pipe stoppers, testing sets for house connections, tightness testing sets and further measuring instruments). 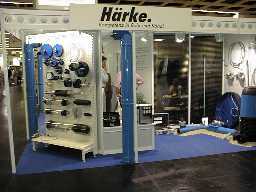 Within the range of the blocking off technology for pipes Haerke looks back on an experience of over 40 years, whereby we are particularly connected about the "problems" of our customers. To solve these "problems" not only standard products are used but also individual custom-made products, conceived for the individual employment. The constant dialogue with our customers, e.g. on fairs, exhibitions and with training courses and the information and suggestions resulting from this are converted consistently into our product development and improvement. The repair ability of our flexible plugs and test plugs as well as their suppleness in pipe curves are only some results of the requirements to our products on the part of our customers.